Original 1981 LP cover of "Many Many Women" designed by David Freedman with art by Charles Clough. Many Many Women, for voices and instruments is a large-scale musical composition. 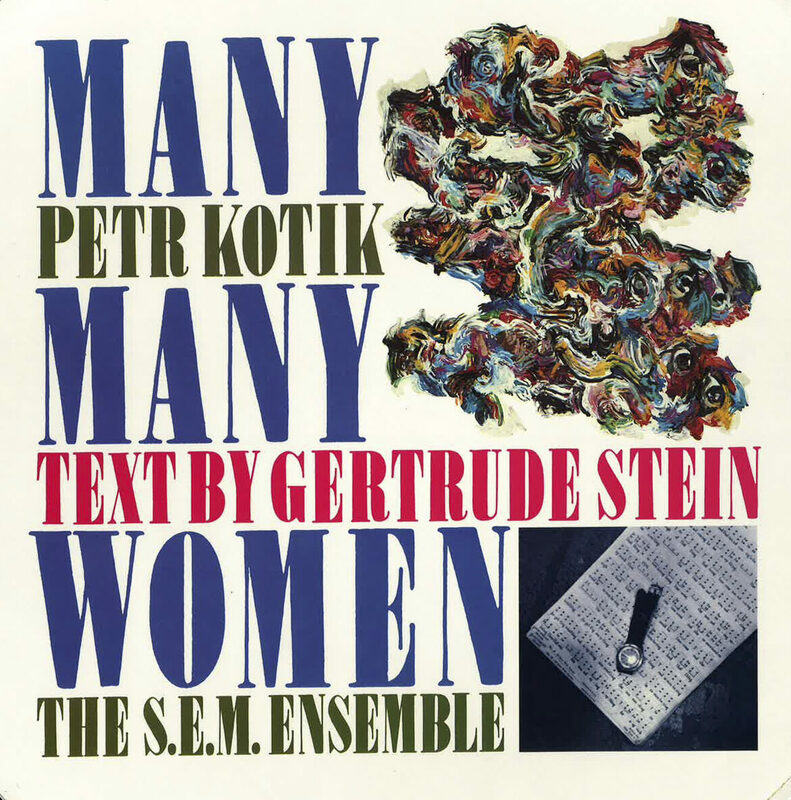 The composition uses the text of the 86-page novella “Many Many Women” by Gertrude Stein. The score is divided into 173 sections on 381 pages. Individual sections are distributed among the singers and instrumentalists and performed in order from lowest to highest number. The music uses pure intervals (octave, fifth and fourth), therefore each part is performed by two of each voice or instruments. The start of each section is up to each pair of musicians and there are silences between each section. The flow of the music – the timing of entrances and the duration of silences – are decided spontaneously during each performance. Once a section begins, it is performed according to the score. Not all sections need to be performed, making it possible for a partial performance. The piece can also be understood as a “musical situation.” The way the score is read, performed and listened to creates an environment different from that of a conventional concert. Each performance and rehearsal varies: not one moment can be reenacted, not one moment will happen the same way again. This is why both a studio recording and a performance can only be realized live. Although the entrances of sections and the silences separating them are always different, the music is consistently the same. The complexity of the music and stamina required to perform it makes it almost impossible to go through the piece without mistakes. They are usually minor and not noticeable. Once a performance is recorded, however, even the smallest mistake grows, becomes prominent and interferes with listening. Every recording of Many Many Women needs careful editing. Many Many Women was recorded in 1980, following an extensive tour by the S.E.M. Ensemble. This was an ideal time to go into the studio to record the piece. There were two six-hour sessions on two different days, and during each session, SEM recorded the entire Many Many Women. The task of combining the best takes and editing the material took several months to complete. This is why instead of a six hour performance, the recording is only three hours and 35 minutes long. In 1980, the S.E.M. Ensemble did not include trumpets, therefore clarinets were used instead (although I do prefer trumpets). All parts are transposable and can be performed on any melodic instrument. The same is true for the voices. So far, only wind instruments have performed Many Many Women. For more info about Many Many Women, check out reviews and liner notes collected over the years.